Indiana Affenpinscher Rescue View other Affenpinschers for adoption. 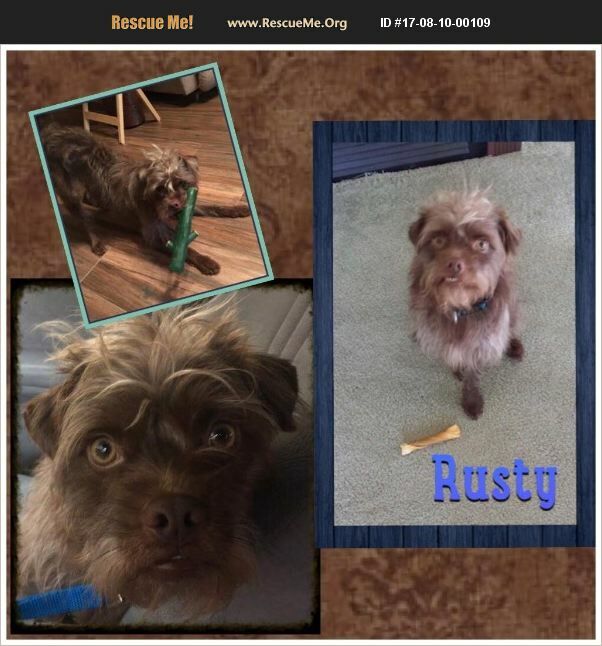 Rusty is a young, 2-3 yr old, 15lb purebred affenpinscher, we believe. This quirky guy had a rough start to life and was then surrendered to a shelter. We understand he was abused by a male teenager and would try to nip to protect himself. He seems to trust women a bit more but he loves his foster dad so we know that with time and patience he can learn to trust any adult. He is very protective of his home and surroundings. Because of his fear issues we do not want to place him with small children. He is totally house and crate trained and loves his toys and his bed. He loves to play with other dogs but like with humans, he needs slow introductions. His owner must be a strong leader and willing to seek training for Rusty. He is neutered, vaccinated, heartworm negative and microchipped. His adoption fee is $150. Please email for an application. souldogrr@gmail.com.